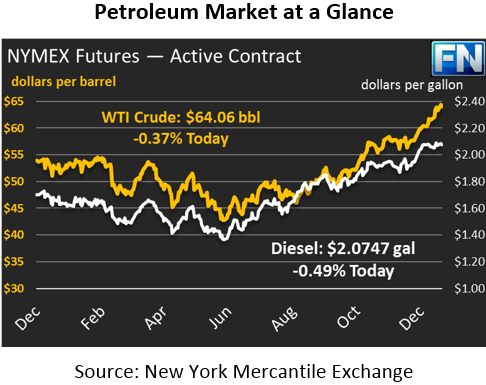 Oil markets once again hit a new high yesterday, with WTI crude closing well above $64. New highs have become the norm in recent weeks, as January has brought $4 in gains in just the first half of the month. Today, prices have cooled off a bit, with prices down by 24 cents, trading at $64.06. Of course, numerous days this year have started off slow and seen prices take off in the afternoon, so we’ll wait and see what happens. Refined fuels are keeping up with crude prices, with diesel and gasoline prices both rising. Today, both are falling along with crude. Diesel prices have given up 1 cent so far, trading at $2.0747. Gasoline has fallen by a meager 0.3 cents, with prices at $1.8461. It’s worth noting that, ignoring flat prices, refined fuels have been falling relative to crude oil as part of a normal seasonal trend. 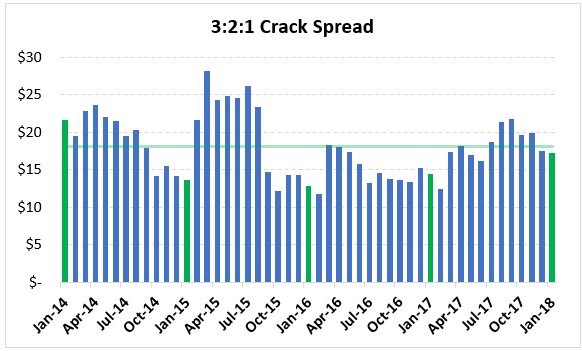 Over the past few years, the January 3:2:1 crack spread has been creeping higher, though not as high as in 2014. Recall that the 3:2:1 crack spread is the estimated refinery margin made from converting 3 barrels of crude into 2 barrels of gasoline and 1 barrel of diesel. Each year the spread rises in the summer, when gasoline formulation changes and strong driver demand spur higher gasoline prices, and fall during the winter. Overall the average spread over three years has been $18; so far, the average spread has been $17.22 this month. That’s higher than usual for January – in 2015-17, January spreads were below $15. This year’s strength is the result of strong diesel demand keeping fuel prices elevated. Higher crude prices are also a contributor – as crude prices rise, 3:2:1 crack spreads can rise while staying at the same percentage rate. That helps explain why the spread was above $20 in January 2014, when oil prices were $95/bbl. News has been slow this week, with no major events other than an Iranian oil tanker crashing over the weekend and causing the largest tanker spill in decades. The event has not had an impact on oil prices. Markets are waiting for the API and EIA inventory data before deciding whether to change their current bullish sentiment. Both reports have been delayed one day due to the MLKJ holiday.